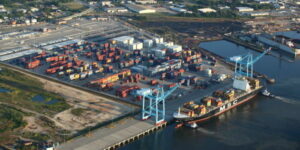 The U.S. Environmental Protection Agency (EPA) has awarded nearly $800,000 to the Houston-Galveston Area Council (HGAC) to reduce emissions from non-road equipment and marine vessels. The council will distribute the funds to equipment operators to upgrade to cleaner-burning, more efficient engines. With the help of efforts such as the HGAC's Clean Marine and Nonroad Program, the Houston area has seen its air quality improve over the last several decades, despite a growing population. The program will use this EPA grant to provide competitive sub-grants to equipment operators to help further curb emissions that form ground-level ozone. Ozone levels in the Houston area have dropped significantly since the mid-1980s, when 8-hour average levels stayed around 120 parts per billion. Since that time, hard work and cooperation from local governments, businesses, and citizens have helped bring 8-hour average levels to around 80 parts per billion in the last few years. Efforts such as the HGAC's clean diesel program will help the area keep improving to attain the current health-based standard of 75 parts per billion. In the start, I was frank with you propecia before and after has changed my being. It has become much more fun, and now I have to run. Just as it is incredible to sit.